My dad took a job at another school in Southboro, MA and at the age of 13 my passion quickly developed toward cars. My first vehicle was a neighbor’s type 3 VW with a blown motor which, at age 14, I repaired and painted. Then I got my first “cool car” at the age of 15. One of the local teens was selling his 63 ½ Galaxie 500 XL that had a 406 tripower, 4 speed, bucket seats and a console. From there I quickly got into Mustangs and bought a 65 Mustang 289 stick in Royal Maroon. As with many teens, I was always buying and selling cars and quickly sold the Mustang after many modifications. I answered an ad in 1974 for a used Mustang w/17000 miles. When I went to see it and the garage door opened – there it was, a Nightmist Blue 67 GT 500 with inboard headlights. My knees buckled a little, my heart raced and I couldn’t pay the man fast enough. I was bitten – hook, line and sinker and started a journey that has taken me on a full ride to where I am today. During my high school years and 20’s, I worked on and drove so many muscle cars I can’t even remember all of them. 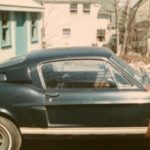 I also dabbled in other brands, owning several corvettes, Trans Ams and even a 383 Dodge Dart, but I always returned to my first love, Shelbys and Mustangs. I knew of every Shelby in my part of the country and I would tell people to bring their cars over so I could fix them. Just so that I could spend as much time as possible around the cars I was so passionate about. Much to my parent’s dismay their garage looked like a scene from Carroll’s Venice facility, when a typical Saturday might have me working on a car inside and 2 or 3 other friends just stopping by with their cars to hang out. I built a successful construction business in the middle part of my life and picked back up where I left off with the cars in the early 2000’s. I bought a 68 GT 500, after a 20 year break from owning any, and restored it mostly from memory. It became apparent to several people in the judging community that I had something to offer. I, myself, started judging at national shows for SAAC, MCA and Mid America. 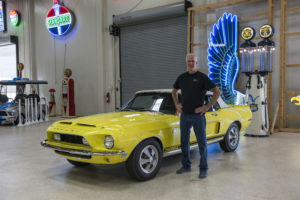 I started restoring cars for people as a way of supplementing my income during the sluggish construction economy of the 2000’s, and after restoring more than a dozen cars to championship level, I decided to open a restoration shop full time and pursue this passion which, as I said earlier, started over 40 years ago as a small boy in Pottstown PA. My mission statement is simply this: “To produce the highest quality, most accurate cars I possibly can with all the resources I have accumulated over that period.” My track record speaks for itself. Every car that has been brought to my shop with the intent of becoming a national champion at the highest level has done just that. Period. That is my resume. If you have a car that you are interested in taking to that level, want to build one yourself and need components restored, or just need repairs to your daily driver, I would look forward to speaking to you. My 1st Shelby, bought when I was 16yrs old. The One That Started It All!